So how do you enjoy ? We are at 20 de enero sur #44. It is a few doors up from Pet Vet on the corner of Stirling Dickinson. For lots of details and a map and a picture ... google "Olivo Verde Miguel Allende"
After a happy period of busy growth, there is finally time to do things like maintain this blog. Soon I should have the complete menu available here. We now have a second dining area which can be used as for gallery openings. And then have a mostly finished third area ... lovingly called the Puttanesca Sala. Check the entry below this for a slow motion video of Denver flaming some pasta. How long: The cooking class is scheduled for one hour. Historically it always lasts longer ‘cause no one wants to leave, so allow for that. Please be considerate. Space is limited and if you make a reservation, please honor it. Payment in advance at Los Olivos is appreciated and insures you a space. This involves a magazine photography shoot so be prepared for the fun. Los Olivos is open and so much more to enjoy!!! First an apology. Due to the wonders of modern password technology I was unable to access the blog for a while. Now that I am back everything will be updated. 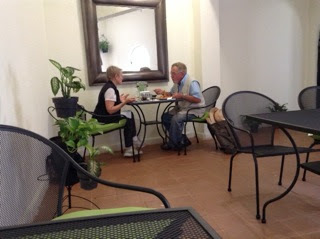 Los Olivos de Denver is open and we were happily busy even during SMA's traditionally slow time. Our hours are the same ... Wednesday thru Saturday ... noon to 8. Our menu is similar and during June we will be bringing on a variety of appetizers. As soon as that is done we will turn our attention to drinks and desserts. The place is much bigger ... with ultimately 4 dining areas including a Jacaranda shade covered garden. We are at 20 de enero sur #44. This is just off Stirling Dickinson 5 doors up from Pet Vet. There is no street sign, so remember Pet Vet. Since it is a one way entering Stirling Dickinson, the easiest thing with a car is to go up the one way street before or after and circle the block. We have a Bose speaker system. Not too loud and that's fun to listen to. Sign is easy to spot over our door. Italian sausage, drizzled in marinara sauce, served on a baguettine. A Bagueattine is a tiny Baguette. Crunchy. Baked by an Italian. Denver now has a staff and a 10 burner kitchen so he is working on specials. I will email out a notice late Sunday evening about what we are planning. If you want to be on that list, contact me here. With (mock) tears, Denver’s Olivo Verde announced Saturday, the 24th was the final opportunity to (almost) lick your plate clean in their present (hard to find) location. With (true) joy, Denver announces that he will soon be back cooking in a new (easy to find) location with a (delightful) new name and a (happy) expanded staff. After a bit of a rest, we will begin renovations on Monday, 6 April. There will be heaps more seating in several dining areas. Plus home delivery, catering, whatever your little (foodie) heart desires. There will be a larger kitchen in which to unleash Denver … so you can expect more variety, desserts, appetizers, (non-alcoholic) drinks in addition to wine and beer. Lots of surprises. It is a restful place … not on a busy street … lots of parking … easy to get there by taxi, foot, bus or car … everything fresh and clean. Oh yeah … there was joy in the kitchen when we learned our little place took #8 in this years SMART’s awards (out of some 280 restaurants in SMA). Little us, up against the well funded big guys. Thank you, thank you, thank you for all your (loving) support. This time we go to the San Juan de Dios market … to shop in the stalls for the various unpronounceable ingredients. Xoconostle is a pale, almost white tuna ... the fruit of the nopal ... and different from the red ones normally seen. Verdolagas is a highly regarded leaf vegetable enjoyed world round ... except for north of the border, where ... silly people ... it is regarded as a weed. The chicken for the soup stock will likely be free range as it has a distinctive flavor. Thankfully, here will not be a demonstration of the early stages of preparation. There will also be other accompaniments demonstrated along with fresh, hand made tortillas. If you need a vegetarian option, let us know in advance. Reservations are strongly recommended as the classes are limited in size. If you have reserved and paid in advance, your place is assured. Market tour … San Juan de Dios Church … noon … go down Canal, turn right on San Antonio about mid-way down ... and it is 1 block over. Experience … at the restaurant … 1:00. Reservations by email (link here). Payments at the restaurant. Our menu is now fully available most of the time. Our concept is ... do it your way. Choose your pasta ... then your sauce ... Marinara, Ragù (meat), Alfredo, or chef’s choice ... and then, if you like, customize it with broccoli, chicken, bacon, olives, capers, peppers, roasted garlic, parmesan and more. Basically everything is prepared to your order. You can create the full, customized pasta for only 75 pesos. You might want to contact us. Please understand when you call ... we may be happily very busy. He is a native San Miguel resident who trained as a chef in the US. For a while he was a traveling training chef for the Olive Garden. Now he is available at Olivo Verde where he personally prepares meals for you, customizing them to your preferences. Think of him as your personal chef. Occasionally he provides services for parties and special occasions. Ask him how he got his name. I'm the elf. A literate, not alliterate, alliterating author. Like all good elves, I am rarely seen, but can be heard. Go to my profile ... click on the audio link ... then click on the picture in that link to hear my lilting tones reading content composed by me.